“Gimmick” matches have always had an important place in the world of professional wrestling. As standard wrestling matches can become a bit stale, various types of competitions between wrestlers are used to keep the public’s interest. Wikipedia includes a long list of these types of competitions. Armwrestling matches are seen by many as a good test of strength and have therefore been used throughout the history of professional wrestling as a different way to show who the better man is. While all armwrestling matches are staged in professional wrestling (i.e. the winner is pre-determined), a few wrestlers actually do/did have a background in organized armwrestling competition. The wrestler with the most successful armwrestling career is Scott Norton, who won the super heavyweight class of the Over the Top World Championship in 1986. (This tournament served as the competition backdrop for the Sylvester Stallone movie “Over the Top”.) 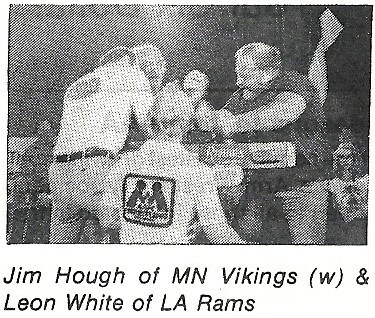 Another wrestler, Leon White (“Van Vader”), made it to the later rounds of the AWI NFL Super Classic armwrestling tournament on two occasions in the late ‘70s and early ‘80s, during his brief football career with the Los Angeles Rams. Scott Bigelow ("Bam Bam Bigelow") also briefly tried out the sport and enjoyed considerable success, finishing in an impressive second place at the World Professional Wristwrestling Association (WPWA) Worlds behind only Cleve Dean in 1980. Finally, Richard Rood (“Ravishing Rick Rude") competed in a few armwrestling tournaments in Minnesota in the early '80s and also reportedly finished 6th in an AWI pro light heavyweight world championship in 1983, though this assertion has not been verified. One of the first major professional wrestling stars to regularly use armwrestling matches to demonstrate his superior strength was Superstar Billy Graham. In 1973, he declared himself “the arm wrestling champion of the universe”. However, he did lose the occasional match, perhaps most famously to André the Giant in 1975. Aside from being staged, armwrestling matches in professional wrestling differ from armwrestling matches in organized armwrestling tournaments in two significant ways. 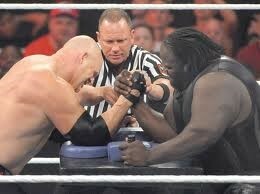 First, pro wrestling armwrestling matches are always long. Typically they last over one minute in length and feature a lot of back and forth action. Long matches of this type are much less common in actual armwrestling. Second, very few pro wrestling matches are free of controversy. Many don't actually reach a pin -- either one of the wrestlers stops pulling in order to hit the other, or someone else interferes (which could involve any number of things). Of those that do end in a pin, there's almost always an excuse -- there was a distraction, the winner cheated/started early, etc. 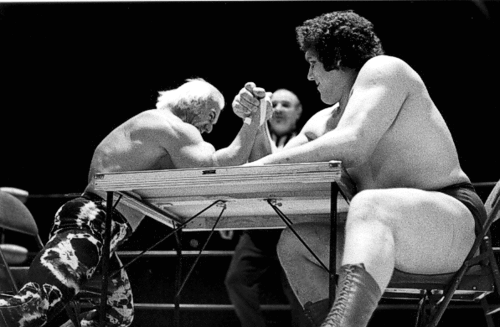 Through the '70s and '80s, almost all pro wrestling armwrestling matches were done sitting down. A variety of different tables were used, but they were generally of the folding style, with the competitors seated on folding chairs. Because the tables and chairs often ended up being thrown, they needed to be relatively light. On rare occasions, the tables may have had outlined areas for where the elbows needed to stay, but they never had pin pads. Armwrestling matches were featured most prominently on televised professional wrestling in 1992 and 1993, when Jesse "The Body" Ventura hosted an invitational "Strongest Arm Tournament" for World Championship Wrestling (WCW) two years in a row. The story goes that Mr. Ventura invited the WCW wrestlers that he considered to have the strongest arms to compete in the tournaments. The "Strongest Arm" tournaments used a single elimination format, and each had eight competitors. An actual stand-up armwrestling table was used (for most of the event), with hand pegs, pin pads, and elbow cups. This was perhaps the first time such a table was used in a professional wrestling setting. The tournaments were run in November and December of the respective years, with one match occurring each week. In a funny twist, after Van Hammer's tournament victory wrestler Tony Atlas entered the ring, upset that he wasn't even in the tournament. Van Hammer therefore challenged him to a match but because it wasn't sanctioned the match couldn't take place. Vader was not originally involved in the 1993 tournament, but was brought in for the semi-finals because a replacement was required for Sid Vicious. Though never explained on air, Sid had recently been involved in a serious real-life scuffle with wrestler Arn Anderson, and many WCW wrestlers threatened to leave the organization because of him. WCW ended up having to release Sid from his contract. After the two annual Strongest Arm tournaments, armwrestling matches once again became relatively rare occurrences in pro wrestling. Since then, when there have been matches, they've typically been decided on stand-up tables. It appears that staged armwrestling matches will continue to play a very small, but nonetheless entertaining role in the world of professional wrestling. 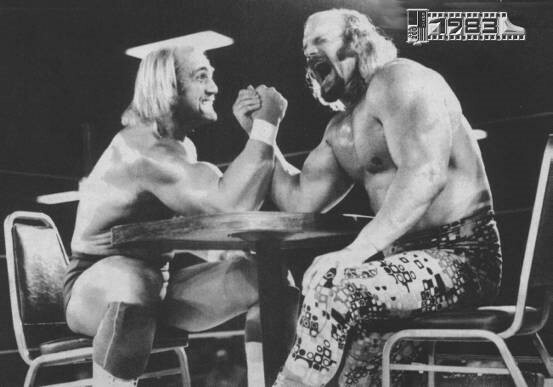 Below are some pictures and clips of classic armwrestling matches in pro wrestling history. A classic 1975 match between Superstar Billy Graham and André the Giant. André won. 1978 match between André the Giant and Terry Boulder (Hulk Hogan). André won because Terry was disqualified. Below is a series of three matches between Ric Flair and Bad Leroy Brown, circa 1981-82. The NatureBoy just doesn't know when to give up! A 1983 match between Hulk Hogan and Jesse Ventura. Hulk won. An unofficial match between Ravishing Rick Rude and Hulk Hogan from 1988. They competed lying down. A 1997 match between Sunny and Marlena, with the Honky Tonk Man officiating. Marlena won because Sunny was disqualified. A funny match between Chyna and Vince McMahon from 1999. A match from 2008 between John Cena and Mark Henry. They were standing on the wrong sides of the table, with their elbows on the pin pads! Calamity ensued and the match was not finished. A broken glass armwrestling match between The Great Khali and Triple H from 2008. Of course, the match did not result in a pin. Khali was disqualified for headbutting Triple H just when he was about to lose. Kane and Mark Henry in a 2011 match. Kane won because Mark was disqualified.It would have been interesting to see a “real” match between these two.Mark was a professional strongman and Kane has been described by Brock Lesnaras the strongest guy in the WWE. Special thanks to Jeff Dabe for supplying information about Scott Norton and Rick Rude's early days in the sport.